If you want to improve muscle growth, you want to improve muscle recovery. This guide will show you how. When it comes to accelerating muscle growth, most people gravitate toward training and supplementation strategies. They look for fancy new workouts purportedly used by bodybuilders or celebrities, or supplements that claim to increase anabolic hormones or induce muscle growth in various other ways. Some consider dietary strategies as well, but few give much thought to muscle recovery and how it relates to muscle growth. Well, muscle recovery has everything to do with muscle growth, and is in fact the primary limiter of how much muscle you can actually gain. Regardless of how hard you train, if your body can’t recover properly, you won’t make any gains to speak of. In this guide, we’re going to look at what muscle growth actually is and why recovery is such a vital part of the process, and what we can do to accelerate our muscle recovery and thus muscle growth. Do you have any muscle recovery tips you'd like to share? Did you like this guide? Let me know in the comments below! Although simple, the physiological process of “muscle recovery” is actually a mystery to many people. What exactly is happening when your muscles recover from a work out? Well, every day, trillions of cells in your body are dying and being replaced. This is known as “cell turnover,” and it’s regulated by a complex system of proteins and hormones. Now, when we engage in resistance training, we damage the cells in our muscle fibers. This is the real cause of muscle soreness, not lactic acid buildup, as some people believe. This cellular damage signals the body to begin the repair process, which requires an acceleration of the normal rate of protein synthesis. 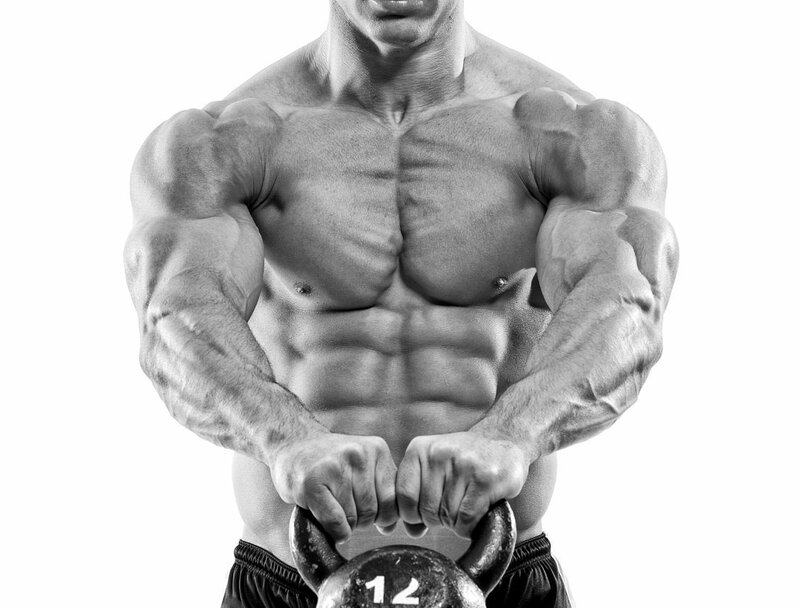 As you have probably heard, this process is regulated by anabolic hormones like testosterone, human growth hormone, insulin-like growth factor-1 (IGF 1), and others. Our body is smart, too. It doesn’t want to just repair the muscle fiber to its previous state–it wants to adapt it to better deal with the type of stimulus that caused the damage.That is, it wants to add cells to the muscle fibers, which makes them bigger and stronger. Thus, what we think of as just “muscle growth” is actually the result of protein synthesis rates exceeding protein breakdown rates. At the end of, let’s say, every 24-hour period, if your body synthesized more muscle proteins than it lost, you gained muscle. If it didn’t, you didn’t. Now, the reason I brought all this up is to highlight the importance of muscle recovery, and how it relates to muscle growth. Improving muscle recovery boils down to increasing protein synthesis and decreasing protein breakdown, which results in a “net protein gain,” which we see as increased muscle size and strength. So, with all that out of the way, let’s now look at some strategies for improving muscle recovery. This is how you lose fat, but it comes with a price: reduced anabolic hormone levels and impaired protein synthesis. That’s why you generally can’t build muscle while simultaneously losing fat–the calorie restriction necessary for weight loss prevents it. And that’s why you need to make sure you’re eating enough food every day if you want to maximize muscle recovery and muscle growth. How many calories should you eat every day, then? Well, you want to ensure you’re at least eating as many calories you’re burning every day. A slight surplus, 10-20%, is advisable to maximize protein synthesis rates. By 1.5 if you exercise 7+ hours per week. For example, I weigh 190 lbs and am about 7% body fat, and per the above formula, I burn about 2,800 calories per day. This is what I’m currently eating every day, and it’s allowing me to make slow, steady increases in strength and size while staying lean. We’ve all heard that a high-protein diet is important for building muscle, and now you know why: dietary protein provides your body with the raw amino acids it needs to synthesize its own proteins. This is why eating enough protein every day is an important part of maximizing muscle recovery. How much is enough though? Research has shown that protein should comprise approximately 30% of your daily calories. For most people, that comes out to be about 1 gram per pound of body weight. While meal timing isn’t generally important, having protein both before and after your exercise is advisable, as it has been shown to enhance recovery, immune function, and growth and maintenance of lean body mass. Carbohydrates supply our body with the molecules needed to synthesize glycogen, which improves physical performance. Furthermore, research has shown that when muscle glycogen levels are low, exercise-induced muscle breakdown is accelerated. Why is that bad? Aren’t we trying to break down our muscles with exercise? Yes, but remember that our body can only synthesize so many muscle proteins every day. If we cause too much damage with our exercise, our body simply won’t be able to keep up with repair, which can result in us actually losing muscle despite regular training. Carbohydrates stimulate the production of insulin, which doesn’t induce protein synthesis, but does inhibit protein breakdown and thus affects overall muscle growth. One study compared high- vs. low-carbohydrate dieting and found that a subjects following the low-carb diet had increased protein degradation and reduced protein synthesis rates, resulting is less overall muscle growth. While low-carb dieting has benefits for those with impaired glucose metabolism (diabetics or pre-diabetics, for example), it is not good for maximizing muscle growth. So how how many carbs should you be eating every day? A good place to start is getting 30-50% of your daily calories from carbohydrate. It’s also worth noting that post-exercise carbohydrate intake will result in an accelerated rate of glycogen resynthesis. Shoot for about 1.5 grams of post-exercise carbohydrate per kilogram of body weight. Getting enough sleep important for muscle recovery as well (not to mention general health). Research has shown that sleep deprivation can cause muscle loss, and it has also been linked to muscular atrophy. One study conducted by the University of Chicago found that when 10 healthy men reduced sleep for a week from about 9 hours per night to 5, their testosterone levels dropped by up to 14% during the day. It’s also known that insufficient sleep decreases growth hormone and insulin-like growth factor-I (IGF-1) levels, which play important roles in maintaining muscle mass. Sleep deprivation has quite a few other negative effects as well, including decreased fat loss, increased risk of chronic disease, reduced physical performance, and more. How much sleep should you get, then? Sleep needs vary from individual to individual, but according to the National Sleep Foundation, adults need 7–9 hours of sleep per night to avoid the negative effects of sleep deprivation. There’s another factor to consider when looking at sleep and muscle recovery. Most of us would assume our bodies repair a large amount of muscle while we sleep, but research has actually shown that muscle protein synthesis rates are quite low during this time. Because of the limited availability of amino acids. You see, unless we eat protein before we go to sleep, our body runs out of amino acids with which to rebuild itself and must wait until our next meal to continue the process. Keep in mind that this doesn’t mean you lose muscle while you sleep (this is a myth), it just means that without the raw materials necessary for recovery, your muscles can’t recover. And your body gets those raw materials from absorbing nutrients (amino acids primarily) in food you eat. Thus, it’s no surprise that research has shown that eating a slow-burning protein like casein before going to sleep helps with muscle recovery. You can find a supplement for just about anything, and recovery supplements are quite popular. Let’s look at some of the common ones and whether they work or not. BCAAs taken both before and after exercise has been shown to reduce muscle breakdown and accelerates recovery…BUT…that doesn’t mean you should necessarily buy some. Because eating protein accomplishes the same thing, and especially a fast-asborbing protein that’s high in leucine (an amino acid that strongly initiates protein synthesis), like whey. I only use BCAAs if I’m training fasted. Another common product sold as a muscle-building, recovery agent is the amino acid glutamine. At first glance, it looks like supplementation with glutamine would work as promised. Research has shown that intramuscular glutamine levels play an important role in protein synthesis and the prevention of muscle breakdown. It also improves the body’s ability to use leucine. But here’s the kicker: there’s no research to indicate that supplementation with glutamine improves protein synthesis in healthy, well-fed adults (as opposed to humans and rats in diseased or under-fed states). To the contrary, in fact, several studies conducted with healthy adults showed that supplementation with glutamine has no effect on protein synthesis, muscle performance, body composition, or the prevention of muscle breakdown. Now, while supplementation with glutamine won’t help your muscles recover, it has been shown to help the body deal with the systemic stresses of regular, prolonged exercise. That is, it can help prevent overtraining. Creatine is a substance found naturally in the body and in foods like red meat. It is perhaps the most researched dietary supplement in the world of sports nutrition–the subject of over 200 studies. Among its many benefits are reduced exercise-induced muscle damage and inflammation. Yet another reason to supplement with creatine. Carnitine is a compound that your body produces from the amino acids lysine and methionine, and it plays a vital role in the generation of cellular energy. Research has shown that supplementation with carnitine reduces exercise-induced muscle damage and soreness, and improves muscle repair. Do you have any muscle recovery tips you’d like to share? Did you like this guide? Let me know in the comments below!